Why we sell what we sell…. Among the final items we are planning to bring you this calendar year is some Lewis County, NY material. These two items were originally issued on the Lewis County CD-ROM which we discontinued a few months ago, but are now again making available, but this time, at a substantial savings, as downloadable files in PDF format. Originally the north end of Oneida County, NY, Lewis County is indisputably part of the “North Country” and as such historical material can be a bit skimpy. We are happy to be able to offer these items to help those who need them. One of these republications is Child’s redoubtable Gazetteer and Business Directory for Lewis County for 1872-73. Child did these of most New York and Vermont counties, and later expanded into other states. He had a formula for producing these collections of historical material, and, based on this one and other Child Gazetteers we’ve seen, the formula worked very well. Most of the information contained is still of great interest to local historians and genealogists nearly a century and a half later. If you would like more information about this download, please click HERE to go to a page all about it. The second item is modest in size and of less general interest, but since we have it we would be remiss not to again make it available. This is a survey of local relief in Lewis County in 1906. Extracted from a three volume survey produced by the state in that year, this is information you are unlikely to find elsewhere. However, be advised that this section is short. There were no state hospitals or other facilities in the county at that time, and the services provided by the county itself were quite limited. Nonetheless, you may find that it’s worth a look. Click HERE to go to our main Lewis County page, where you will also find other Lewis County, NY material. Between the Lakes Group helps you recover history! Back in August we made the momentous “CD closeout” decision — that we would discontinue selling our historical and genealogical CD-ROMs, and gradually migrate the contents of our CDs to downloads. Well, it’s been happening! We’ve eliminated around a dozen of our CDs as the inventory sold out, and we’re making progress migrating their contents to download format. –A number of smaller, less significant publications that were once lurking on CDs with little publicity are now available as individual downloads — with their own catalog entries. People can actually find them! Eventually they may even show up on Google! –We’ve saved time and money. When you deal with physical inventory — creating the CDs, reproducing them, maintaining the inventory, and shipping them — you spend more time, effort, and money than one would think. The net result is that we have more time to spend finding more historical and genealogical material and making it available to you. –Our customers have saved time, money, and helped avoid clutter. Saved money? Yes! When we discontinued our Canaan, CT CD ($20) we replaced it with three downloads. If you bought all three, you would barely spend half that. And we doubt many people will buy all three. The clutter speaks for itself — we never devised a perfect way for storing CDs of our own so we could find things when we needed them, and it’s easy to store downloads on your hard drive. And time: we figure that it costs us two or three minutes each time we need to put a CD in and wait for it to crank up, and then to go through it to find what we want, and we suspect it was wasting your time too. Furthermore, downloads arrive instantaneously. CDs come by postal mail. Enough said about that! If one of these matches your research interests, we do advise you to act now. Once the CDs are gone, the material on them goes into the queue awaiting republication as downloads. There, they vie for priority with the new material we’re working our way through, so it could be a year or more before material on a discontinued CD is again available. A word to the wise should be sufficient! As always, thanks to our faithful customers. It’s you whom we do this for, and even as the CD closeout continues, it’s your needs we try to satisfy. We try never to forget that. Our experience has been that using available gazetteers to get a comprehensive overview of a county or a community is a great way to get started finding out about a new area. Nearly always they have lists of inhabitants (usually heads of households) at a point in time about a year before the publication date of the gazetteer in question. That’s almost enough to justify using these sources all by itself! For example, often there is a county map. 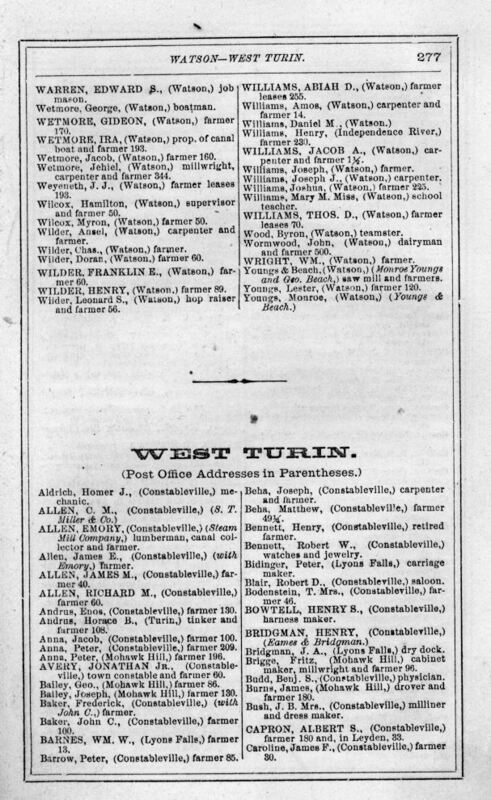 There are capsule histories of each township in the county, which usually include population statistics. Generally there’s short description of the educational system, some details about each community in the county, and a list of the houses of worship in the township with some statistics here as well. We always find the advertisements — and the economics of gazetteer publishing dictated that there would be lots and lots of them — fascinating vignettes of rural life in that time period. Gazetteers are also (justifiably) criticized as containing a fair number of pages of what can best be described as boilerplate, which appear in virtually all editions of that publisher’s gazetteers. Examples include short descriptions of the states and territories, stamp duties, postal rates and regulations, popular nostrums of the time, and the like. But this material (which actually is worth reading once, anyway) is not what you buy a gazetteer for: you buy one to learn about a county and what was in it. We’re happy to publish no less than three of Child’s gazetteers of various counties in New York State. If one of these counties circa 1873 is of interest to you, by all means have a look! Maybe, just maybe, one of these will be as useful to you as we have found it!